Babywise: So Much More Than Schedules and Sleep Training! 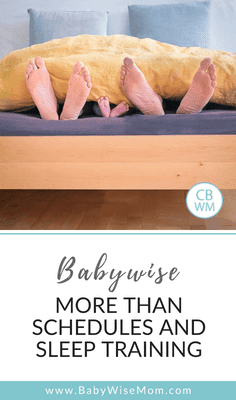 Babywise: So Much More Than Schedules and Sleep Training!. How to work to make Babywise work for you and your family situation. My little brother is a smart guy, but he has always hated reading. He is actually proud(!) of the fact that, at 34 years of age, he’s never owned a library card and can count on his fingers the number of books he’s voluntarily read. So you can imagine my shock when, soon after I announced my pregnancy, he gave me a book. It was called “On Becoming Babywise”, and he swore by it, explaining that this was the secret behind his two boys’ good behavior, discipline, and happiness. I read it and knew right away that our family would be following its principles. I tend to gravitate toward structure and predictability, so the idea of implementing a daily baby-care routine really appealed to me. Also, my husband and I aren’t exactly 22 anymore, so our days of staying up until 2AM are loooong gone. We were all for teaching our baby healthy sleep habits! Most importantly, we loved that the Babywise philosophy was focused not only on the baby, but on the family as a whole. My husband and I were newlyweds, and we wanted to keep that spark in our relationship. We knew that a strong marriage would be the foundation for the loving family we wanted to establish. We implemented the Babywise philosophy from Day One. Well, at least we tried to. On our very first night at home, our little one (I’ll refer to him as “D”) refused to be put down to sleep. He cried inconsolably and turned an alarming shade of bright red from head to toe. Exhausted (and probably entertaining a post-partum hormone party), I broke down and let him fall asleep in my arms as I rocked him. We spent our first night in a rocking chair. Not at all what I had envisioned motherhood to be! The next day, we made a run to Babies R Us (RIP) to buy something I mocked while preparing my baby registry: a co-sleeper. That night, we placed it on our bed between us, and D slept just fine. Our little guy seemed to just need our physical presence. I felt like a humungous failure. And I can’t describe the shame I felt while standing in line to buy that co-sleeper. I remember defensively telling the cashier, “This is just for tonight! We’re not really co-sleepers!” I had gotten it in my head that I was going to take my baby home from the hospital and put down him in his crib, where he’d sleep in peace for exactly three hours until his next feeding. In hindsight, I realize it was probably unrealistic of me to expect my baby to go along with the program we had chosen without his input. I reminded myself that Babywise was meant to help families, not to make parents feel inept. The beauty of it is that there’s room for flexibility. So we made adjustments to our approach. Instead of trying to unilaterally impose a schedule on D, we worked with him to develop a routine and to teach him to sleep independently. We observed what he did and when he did it. We consistently fed D after – not before — he slept, and within weeks, he started falling into a fairly predictable eat-wake-sleep cycles. From there, we encouraged him to continue eating, sleeping, and waking at consistent times from day to day. We also minimized the sleep help we gave him. Except for when it was absolutely necessary in the first few weeks, I didn’t nurse him to sleep. And we avoided holding or rocking him to lull him into a nap. We ditched the co-sleeper as soon as we could, but D still freaked out when we tried to put him in his crib. So we compromised. We ran back to Babies R Us, purchased a bassinet, and placed it next to our bed. We were still close enough for D to feel secure, but we were able to reclaim our bed! Over the next few weeks, we moved the bassinet farther and farther away, until he was sleeping in his crib by himself. The journey definitely had some unexpected twists and turns, but before we knew it, we had Become Babywise! Babywise has given our family so much. Here are some of the biggest gifts we’ve been able to enjoy. Once we settled into a more predictable schedule, D was generally less fussy. It seemed that he found some comfort in the routines we had implemented. I guess that makes sense. A brand-new baby is already dealing with so much newness with his adjustment to life outside the womb. I’d imagine that having a reliable routine gives him a sense of comfort and stability. I lost sight of this during D’s first weeks, but Babywise is not a rigid scheduling plan. It’s about parents leading their babies, not about dictating or imposing. With this in mind, I became more attentive to D. I figured out what wasn’t working for him, what he needed, and when he needed it. I was better able to define my role as a mother, and I started to truly bond with my baby. Having D on a predictable schedule meant that regardless of where he was – at home, at daycare, or at his grandparents’ – he was eating at the same times, sleeping at the same times, and waking at the same times. I believe that D was able to adjust so well to his new environments because he was still able to follow the routines he was used to. There’s comfort and security in routines, and I bet that having his routines at daycare and at his grandparents’ made these places feel like homes away from home. Not only was my return to work fairly smooth for D, it was smooth for me too. Some of my friends had expressed guilt about leaving their babies with a caregiver, but I didn’t feel much of that. Because D’s teachers and grandparents knew and followed the routine we had developed at home, I was 100% confident that D’s needs were being met, that he was being cared for, and that he was happy, comfortable, and secure. I was also able to focus on doing good work because I was so well-rested. I had worked hard to establish my career before I had a baby, and it meant a lot to me to be able to pick back up where I had left off. Sleeping is such a basic, but critical, life skill, and by learning how to do it on his own, D seemed to pick up a sense of independence. He is able to keep himself entertained and play on his own. He can be happy, even when he is not getting an adult’s undivided attention. This may not sound like much, but it is a huge relief to be able to let D play on his own so that I can prepare a meal, have a conversation with my husband, or even just enjoy my cup of coffee while it’s hot. Not only is D independent and happy, I am too. Getting little (and sometimes big) pockets of me-time is satisfying, and it reminds me that I’m my own person. This, in turn, makes me more present and attentive during my times with D.
Although the process of implementing it wasn’t as smooth as I had expected, Babywise has given so much to D and to our family. D is now 16 months old and a healthy, happy toddler. My husband and I are busy and sometimes tired, but we are content. I’m so happy we were introduced to Babywise, and I now understand why even a non-reader like my brother would recommend it so wholeheartedly! I would too.